Basement remodeling ranks just behind kitchen and bathroom renovations as the best way to add to the value of your home. When looking at your basement with a designer's eye, there will be many elements that you will want to remove or cover up. 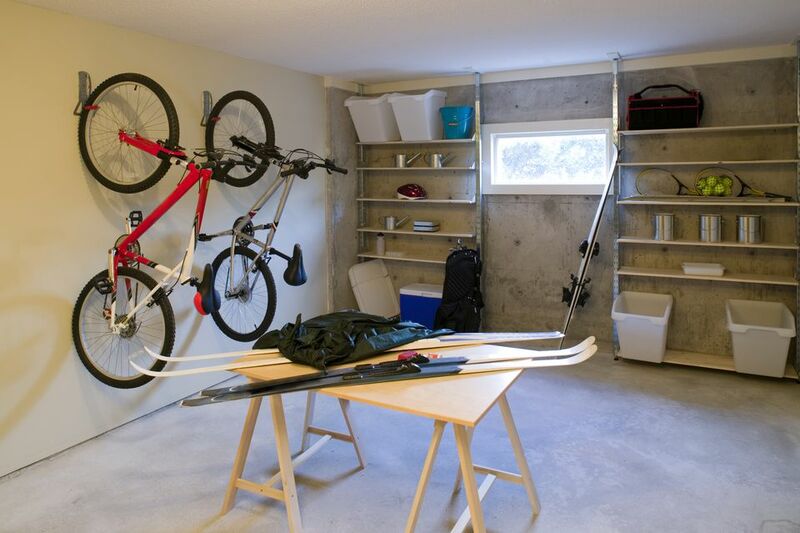 At the same time, that concrete slab floor that is the foundation of most basements may actually have more potential for decorative beauty than you might imagine. Whenever you work with any kind of flooring or surface treatment in a below grade basement location, the first thing that you have to do is test the moisture content of the floor over the course of several days. That is because moisture can often rise up from the surrounding ground soil, into the concrete, causing problems over time. If moisture content in the slab is too high, then you will have to take steps to reduce it before applying any surface treatment to the concrete. Failure to do so can result in bumps, bubbles, and bursts in the treatment, as well as a chilly damn floor underfoot. You should also be aware of whether a vapor barrier is installed beneath the slab. This is done in most newer homes, but in older buildings the concrete may run right up against the soil, leaving it prone to moisture penetration. If necessary a vapor barrier can be installed above the concrete’s surface, and then a micro topping layer can be poured over it. However, this may not be viable in shorter basement spaces. Texture: Often the concrete you find pre-existing in the basement is rough, mottled, and unhewn, with an ugly gray color and a prickly texture that is comfortable underfoot. However, you can hire a professional to come in and grind that concrete down, polishing it into a smooth, flat surface that will be a pleasure to walk upon. Slight texture can be added to this with the application of an appropriate sealing agent. Color: There are numerous ways that you can alter the color of a basement floor. You can stain it, or paint it with a basement safe concrete acrylic. You also have the option of acid staining the material, to get a new, unique, naturally mottled look. Finally, you can also use etching to create precise designs on the floor, or even faux grout lines that will make it look like a tile installation. Rugs and Carpets: While concrete can be beautifully polished and designed, it is still a very hard surface to stand and walk upon. This effect can be greatly softened by strategically placing rugs, mats, and carpets throughout the space. This will create a contrasted look which will evoke a sense of dynamic tension between the various materials on the floor. One of the major drawbacks to concrete in a basement is that it is very cold and austere to the touch. In a basement, which is already a subterranean space, you want to try and avoid materials that will remind people of the stark nature of the environment. However, the use of a radiant heating system can completely change this around, turning chilly floors into warm, soothing surfaces, that fill the space with cozy comforts. Installing radiant heating in an already existing basement concrete floor will require laying the mesh material over the slab surface. You will then have to apply a self-levelling micro-topping treatment which will create a second skin of material over the heated coils. This extra layer may cut down on head space, but it can be relatively thin compared to other surface treatments. One of the great advantages of using concrete in a basement is that you practically do not have to worry about flooding damage. In these spaces, floods can occur from inclement weather, equipment malfunctions, or even broken pipes. A heavy flood will ruin most floors in a matter of minutes. However, a properly treated concrete floor will simply have to be washed thoroughly clean of all debris and then resealed to ensure that it is still properly protected.